Home » Himself or Hisself – What’s the Difference? English has so many varieties of pronouns that even native speakers use some of them incorrectly now and then. Sometimes, these mistakes are so common that they slip into regular usage and become accepted variants. Such is not the case with hisself, though. While some speakers use it instead of himself, the words are not functionally equivalent. You can find out why by reading the rest of this article. What’s the Difference Between Himself and Hisself? In this post, I will compare himself vs. hisself. I will outline the correct pronoun you should use and provide example sentences, so you can see how it should appear in context. Plus, I will show you a helpful memory tool that makes choosing either himself or hisself for your own writing much easier. What does himself mean? Himself is a reflexive pronoun. It is a singular masculine pronoun and refers to a masculine noun that appears earlier in the sentence. Reflexive pronouns have two main uses. The first is with reflexive verbs, which signify that the subject performs an action on itself, like in the phrase they patted themselves on the back. The second is to add special emphasis to a noun, as in the phrase the pastor himself served bread to the poor. Kyle Schwarber swung the bat so hard that he hit himself on the back of the head, causing a loud thunk. Slash himself was said to dislike the opening riff to “Sweet Child O’ Mine” so much that he and Axl Rose fought bitterly in the studio. Antother common reflexive pronoun is myself. What does hisself mean? Hisself is a dialectical variant of himself, using the possessive pronoun his instead of the objective pronoun him. Since a reflexive pronoun functions as the object of a verb, hisself is considered an incorrect formation of this reflexive pronoun. As you can see from the chart below, which graphs the relative usages of hisself vs. himself, the former term is used so infrequently that its line approximates zero. This chart shouldn’t be considered scientific, since it only looks at books published in English since 1800. Still, it illustrates a clear long-term trend in usage in the English-using community during modern times. You should use himself in most contexts, since it is the correct version of this word. Hisself is considered a substandard dialectical variant. You might want to use it if you were writing dialogue for a work of fiction and wanted to capture the way some speakers use English, but otherwise, avoid it in any type of professional, business, or academic piece of writing. 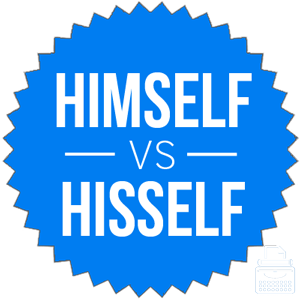 Since his is a possessive pronoun and himself does not indicate possession, it should be easy to remember that hisself is a nonstandard form of this pronoun. Is it hisself or himself? Some speakers use hisself in casual conversation, but it virtually never makes its way into print. Himself is a reflexive pronoun that points back to a masculine noun used earlier in the sentence. Hisself is a nonstandard variant built from a possessive pronoun his, rather than the objective pronoun him. Hisself is never correct, but some English speakers still use it, especially in spoken English. 1 What’s the Difference Between Himself and Hisself?